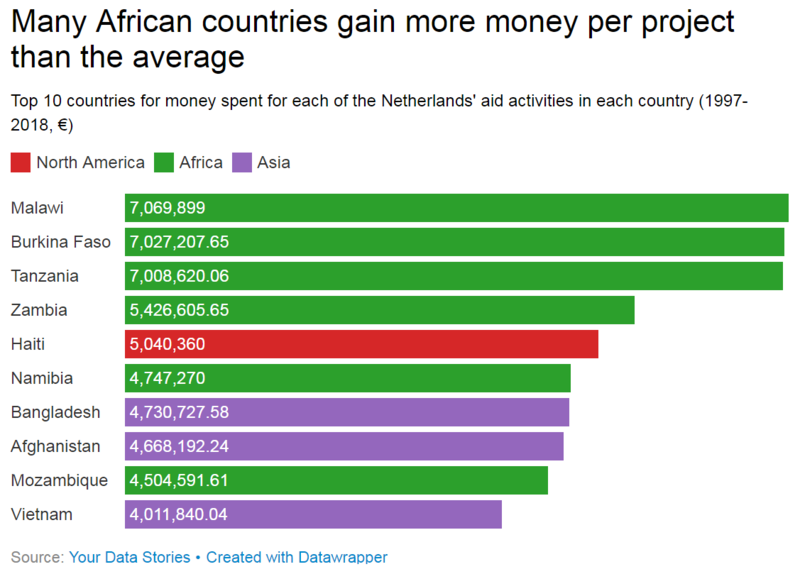 Indonesia - a former Dutch colony - has benefited the most from the Netherlands’ international aid spending, according to data published on the Your Data Stories platform, an open data portal which aggregates aid spending. The Netherlands has budgeted for €702.7m in aid for Indonesia since 1997, €679.5m of which has been spent. Owing to the countries’ shared history, and the subsequent colonisation of Indonesia by the Netherlands, there is a close relationship between the two countries. The Netherlands is therefore attempting to boost trade with the Asian nation - now the world’s fourth largest country - that used to form its largest colony. The Netherlands is funding many projects in Indonesia as a part of this strategy - focusing in particular on disaster-stricken regions of the country, such as Aceh and Nias after the Boxing Day tsunami. There are other colonial legacies to be found in the Netherlands’ development spending. 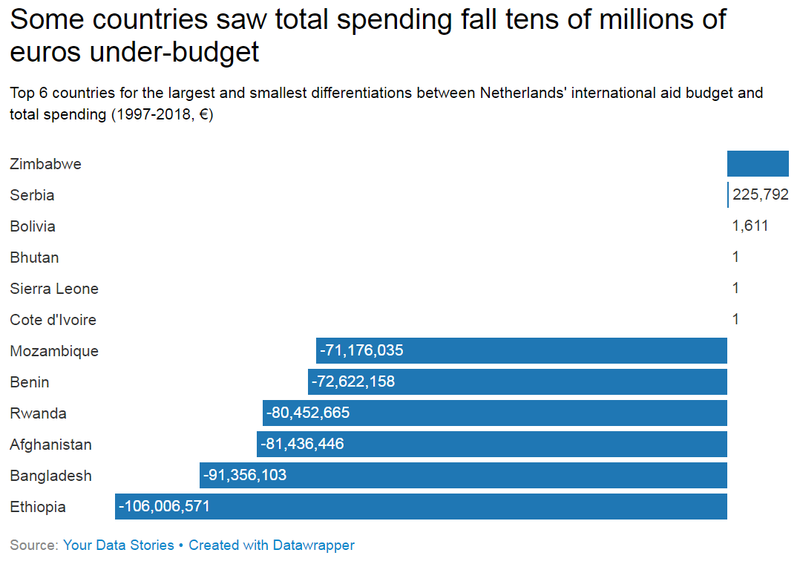 While there is only a small correlation between the population of a country and the aid spending that the Netherlands allocated it between 1997 and 2018, certain countries see huge levels of spending per capita. Suriname has received €458 per person over the last two decades - over 10 times the amount of the next highest country, Rwanda. Its population is just short of 600,000 people, according to the latest estimates from the World Bank. The country used to be one of the constituent countries of the Kingdom of the Netherlands until it became an independent state in 1975. Still, however, Suriname maintains a close economic, diplomatic and cultural relationship to the Netherlands. Like Indonesia, this colonial past goes some of the way to explaining the former colonizer’s large aid spending in the small nation - even if relations have become strained since 2010, when the controversial Dési Bouterse took the presidency despite being held responsible by some for human rights abuses. The Netherlands immediately stopped a planned €20m in aid to Suriname after Bouterse was protected under a new amnesty law, but this was disregarded by the now-President, who declared “I never asked you for €20m. We have economic reserves of almost $800m dollars. €20m is hardly enough for the bridge we are going to build”. 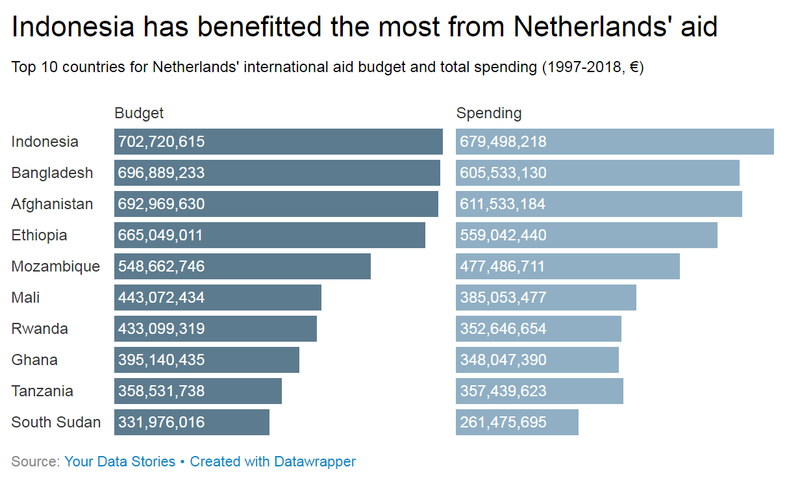 Some other countries have surprisingly high spending totals when compared the small number of aid activities the Netherlands has there. 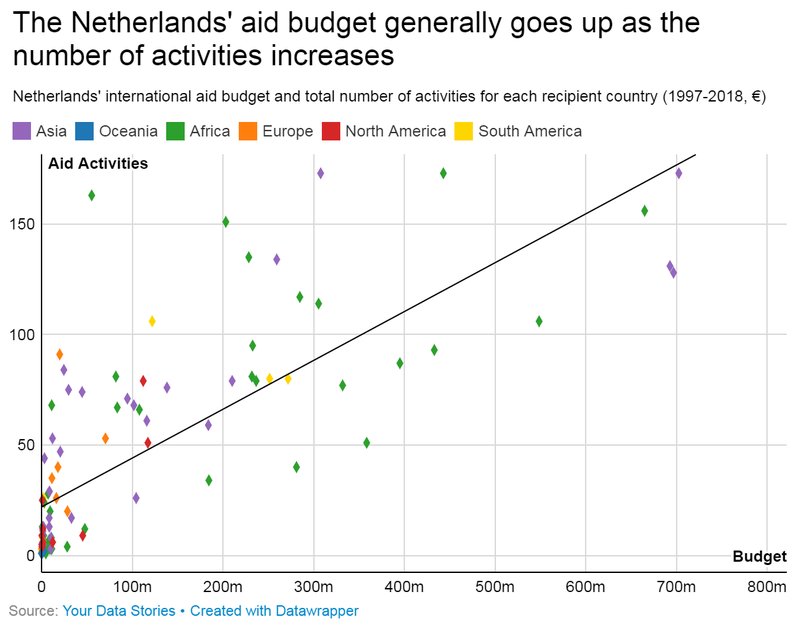 In general, there is a positive correlation between the number of aid activities in a country and the budget that the Netherlands allocated that country between 1997 and 2018. But there are several notable exceptions - many of which are in Africa. Between 1997 and 2018, the Netherlands has spent approximately €9.8bn in international aid - for a total of 4,720 projects. This equates to around €2.1m per project. But some countries seen much higher sums allocated each project - such as Malawi (€7.1m), Burkina Faso (€7m) and Tanzania (€7m). In the last two decades, the Netherlands has taken part in four aid activities in Malawi, spending €28.3m. This is more than the 84 projects it has been involved in in Sri Lanka, where it spent a total of €24.6m - equating to a rate per project that is 21 times the number seen in Malawi. One of the latest examples of the Netherlands’ aid efforts is in tackling the effects of El Niño on rising temperatures in such southern African countries. The money that the Netherlands is spending in Malawi will focus on activities such as repairing wells and building or improving irrigation systems. 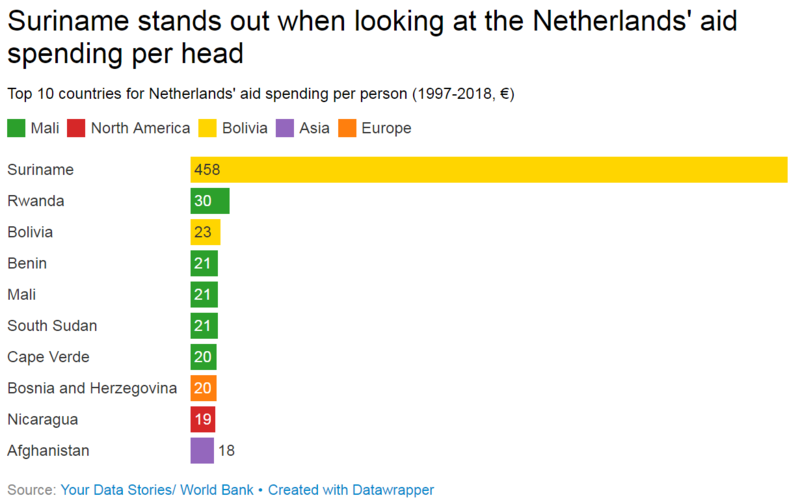 The data also reveals that, while only six countries saw total aid spending by the Netherlands exceed the budgeted amount, some 81 didn’t receive the total amount allocated in the Dutch budget. Zimbabwe saw the best deal, receiving over €10m more (or 19 per cent) in spending than in the original budget - with spending totalling €65.9m compared to €55.3m outlined in the budget. Such a figure is an outlier, however. 19 countries saw a shortfall larger than this, with the largest being Ethopia. The budget states that €665m was allocated to be spent by the Netherlands for development assistance in Ethiopia, but only €559m was spent - a shortfall of €106m, or 15.9 per cent.